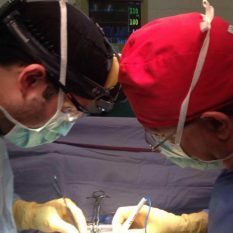 Little did Jim realize then that when he and his wife, Kathy, retired at the end of 2017, it would be their son Ben who took over as the surgeon at the hospital. Ben’s answer was “yes!” He yielded to God’s call to a career in medicine. His idea then was to become a physician who would go overseas from time to time, to relieve missionary doctors. Two years later, during revival services at Mount Vernon Nazarene University, he felt God’s call again. This time he knew God was calling him back overseas to pursue a career as a missionary doctor. 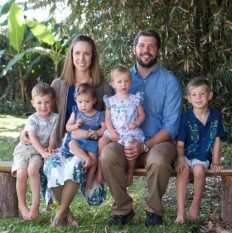 During his junior year, Ben began dating fellow student Katherine Stevens, who told him she had experienced her call to be a missionary at age twelve. They were both pre-med students. Ben graduated in 2003 and worked on campus for a year until Katherine graduated, and they married in August 2004. They were both accepted—the first married couple in the history of the school. After obtaining their medical degrees in 2009, Katherine went on to a residency in family medicine, finishing in 2012. Ben completed his surgery residency in 2014 at Ohio State University College of Medicine where his father had studied. Following his graduation, Ben and Katherine returned to PNG to assist for several months at the Kudjip hospital. The medical college held Ben in such high esteem it sent a quarter million dollars worth of medical hardware with him to the hospital. The high-risk situation required a five-month stay in Ohio for the birth of twin girls, Tabea and Naomi. They then completed their two-year appointment and returned to Ohio for further surgery for Katherine. According to Jim Radcliffe, his son and daughter-in-law serve a hospital that has entered a new era. Katherine, while raising their four young children, is the coordinator of medical volunteers. 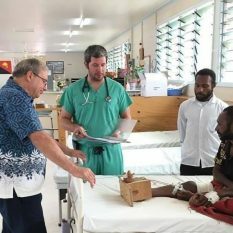 She handles the scheduling of medical students and residents who come to Kudjip from PNG and around the world to do training rotations, and medical professionals who volunteer at the hospital, such as with the Samaritan’s Purse program. Ben, like his father, has a vision of working himself out of a job. He influences the lives of dozens of medical personnel who are learning from him. Kudjip Hospital participates in a program that trains Papua New Guinean doctors who work in rural and remote areas and has recently been approved as a training site for doctors specializing in general surgery. As a doctor, Ben Radcliffe brings healing in the surgical unit. As a follower of Jesus, he lives a life glorifying his Savior. New torches are passing into many hands.